What Will I Learn in an Online Paralegal Graduate Certificate? From the largest law firms to the smallest private practices, paralegals play an essential role in the legal profession. As a paralegal, you will work closely with lawyers to perform research, interview clients, and prepare legal documents. In addition to working in an engaging and fast-paced work environment, you will feel the satisfaction of helping people in your community and beyond. 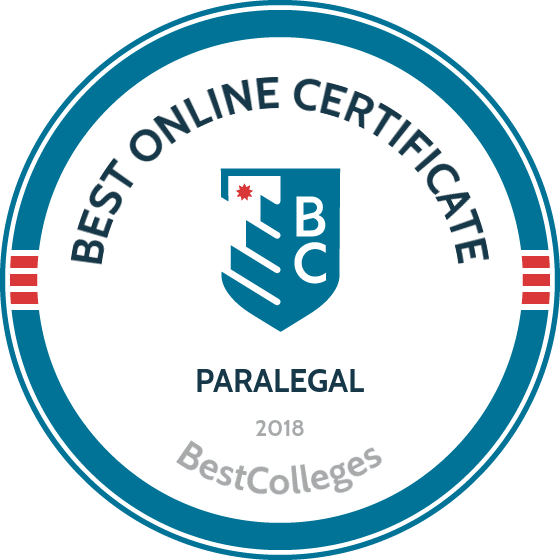 Whether embarking on a new career or returning after an absence, earning a paralegal degree online provides many advantages over other educational paths. The Bureau of Labor Statistics projects an 8% growth in the paralegal field from 2014 to 2024. The fact that the profession boasts a median annual salary of $49,500, well above the national average, is also a major draw. Finally, if you decide to switch careers after working as a paralegal, your education will impress potential employers, as it confers many skills modern office workers require. Your paralegal graduate certificate requires you to complete two to three required courses and a handful of electives. As states' laws differ, your paralegal education will differ depending on your state of residence, as well. If you plan to work in a state different from the one where you currently reside, research paralegal programs located in the state where you plan to work. The courses below represent only a sample curriculum. Your program's courses may differ. Essential Paralegal Studies Part I: Foundational Skills: As the name suggests, this course provides you with the foundation you need for both your future courses and your paralegal career. Course topics include (but are not limited to) legal terminology, interviewing skills, and ethics in the legal profession. Students can expect to take this course -- or one similar to it -- at the beginning of their program. Essential Paralegal Studies Part II: Authority, Research and Writing: After learning the basics, students move on to the advanced writing and research methods that paralegals use to assist attorneys. Courses like this include in-depth instruction in specialized reference tools employed by legal professionals. You can also expect to hone your skills through writing practice summons, depositions, and motions. Paralegal Business Law: Business law regulates the four types of businesses in the U.S.: partnerships, sole proprietorships, limited-liability companies, and corporations. This course provides learners with detailed instruction on legal requirements applicable to business ownership. Like the two described below, this class is an elective that you may choose depending on the type of law that interests you. Paralegal Contract Law: Many people turn to contract attorneys to draft and review their legal contracts. This course provides learners with two distinct advantages when working with contract attorneys. First, the course imparts the skills necessary to identify even the smallest mistakes in clients' contracts. Second, students learn how to draft contracts for your employer's clients. Paralegal Tort Law: When harm comes to a person through a civil wrong, tort law protects them and ensures that the injuring party pays restitution. In this course, students learn much about issues such as medical malpractice and product liability. The course may also include instruction on the recent efforts to reform tort law on the national and state levels. Personal injury attorneys often employ paralegals knowledgeable about tort law. Students of Rice University’s online paralegal graduate certificate program can earn their certificate within five months. Online students across the country have access to legal labs for research and writing. Coursework is delivered synchronously through live online lectures. Students complete an essential skills course, which provides skills necessary for a successful career in law, in addition to courses in legal terminology, legal analysis, discovery, arbitration, and ethics. Graduates work in litigation, bankruptcy, real estate, and oil. Each professor in the online program is a practicing attorney. Graduates receive career support and guidance utilizing the program’s extensive alumni network. Located in the nation's capital, GWU offers an online paralegal graduate certificate program consisting of six courses—American jurisprudence, legal research and writing, litigation, contracts, advanced legal writing, and business entities—which most students complete in two terms. Coursework focuses on legal history and cultivates marketable skills. With the number of paralegal positions projected to increase 8% by 2024, graduates find ample work opportunities in corporations, law firms, and government agencies. Designed for working professionals who are changing careers, the flexible program delivers coursework asynchronously; students do not have to log on at specific times. Applicants should have a bachelor’s degree from an accredited institution. UW offers a flexible certificate in paralegal studies program that is ideal for working professionals. The hybrid program combines in-person classes with three online courses. Students complete courses in the evenings and can earn their paralegal graduate certificate within 11 months. Coursework covers topics relevant to paralegals, including contract law, business law, and legal research and writing. All applicants must have a bachelor’s degree from an accredited institution, in addition to undergraduate coursework in oral communication and English composition. While the GRE is not required, students may submit test scores in place of required undergraduate coursework. Transfer students may apply up to 15 approved credits toward their certificate. Webster's online graduate certificate in paralegal studies program requires 24 credits, which combine practical and theoretical paralegal studies. Courses include civil actions and legal studies. Students may study advanced topics in law, such as torts, contract, probate, and juvenile law. Graduates may apply their certificate toward a paralegal MA degree at Webster. Coursework is delivered asynchronously, which is ideal for working professionals, and the program accepts students on a rolling basis. Applicants should have a minimum 2.5 undergraduate GPA, and the GRE is not required. Students who prefer blended learning may take courses at one of Webster's campuses. MC is a Baptist-affiliated institution located just outside the state capital. The school’s online 27-credit graduate certificate in paralegal studies is an efficient alternative to an online paralegal associate degree. Students are prepared to assist lawyers in government agencies, businesses, and law firms. In addition to preparing students for careers as paralegals, the program promotes the profession, reduces client costs, and provides future paralegals with a solid ethical foundation. Coursework includes studies in legal research, legal writing, wills and estates, and family law. Transfer students may apply up to 12 previous credits toward their certificate. The asynchronous format allows students to maintain full-time jobs while advancing their careers. Graduates have access to MC’s career services department. Earning an online paralegal associate degree or certificate prepares you for careers outside the legal field. For example, paralegal programs confer many of the skills office workers require to excel at their jobs. The positions and salaries below represent just the tip of the iceberg of potential careers for which your paralegal education may qualify you to perform. Administrative assistants work in every industry. Your paralegal education will prepare you to run your employer's office, work with the public, and solve problems as they arise. Library technicians require the same research, writing, and interpersonal skills taught in paralegal courses. In this position, professionals work with with the public to locate materials and assist visitors with research. Library technicians often complete clerical tasks assigned by senior librarians. Training managers identify which employees in their company need training before developing and implementing a training plan. Your paralegal certificate may fulfill your company's education prerequisite for management-level positions. When researching potential programs for your paralegal graduate certificate, only consider those that hold accreditation. Accreditation functions as a seal of approval that a school or program earns after an examination by an outside agency. Accreditation agencies rate a program's rigor and curriculum. Even for certification programs, accreditation is a mark of excellence that employers value when considering applicants. All reputable colleges and universities should have some form of regional accreditation. Six regional accreditation agencies operate in the United States, each supervised by the Department of Education. These agencies oversee educational programs at all levels. National accreditation agencies evaluate specialized learning programs such as distance or online education. As a result, your online paralegal associate degree program should have national accreditation. Finally, independent accreditation agencies oversee programs in their respective fields. The American Bar Association remains the gold standard for paralegal education accreditation. Many avenues exist to pay for your online paralegal degree. No matter your financial situation, fill out the Free Application for Federal Student Aid (FAFSA). Completing the FAFSA makes you eligible for federal grants, work-study programs, and loans, the latter of which have lower interest rates than traditional bank loans. Also, your program may offer scholarships, loans, or work-study opportunities. Finally, remember to research scholarships explicitly created for future paralegals, such as those sponsored by the National Federation of Paralegal Associations.